Korean archaeologists have reported finding two skeletons dating from the 5th century CE under the walls of the Wolseong, or Moon Castle, in Gyeongju in South Korea, the capital of the former Silla kingdom. They appear to be victims of human sacrifice. According to the press release, such foundation sacrifices are widely attested in Korean folklore, but this is the first archaeological evidence. It fascinates me that stories about this practice are so widespread. It is said to have been done for the walls of Copenhagen and the temples of the Maya, for Stonehenge and Great Zimbabwe, for the Kremlin in Moscow and the dikes of Holland. Strasbourg Cathedral is supposed to have required the sacrifice of two brothers, Cologne Cathedral seven sisters. For the Aztec such numbers would have been pathetically inadequate; their great temple was supported by the sacrifice of at least 10,000 victims. In Japan it was called Hitobashira (人柱 ), the human pillar. A sacrificial victim was found under the walls of Gezer in Palestine, one of the most ancient stone cities, and another at Megiddo where the great battle of Armageddon was prophesied to be fought. 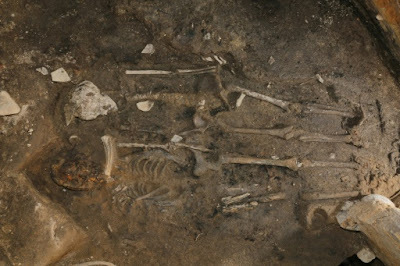 The archaeologists who found these burials were not surprised, because several such sacrifices are described in the Bible. After he destroyed the city, Joshua said, "Cursed be the man that riseth up before the Lord and buildeth the city of Jericho; he shall lay the foundation thereof in his firstborn, and set up the gates in his youngest son." A little further on the story tells us that the man who rebuilt the city did did exactly that, sacrificing his eldest and youngest sons to make the city safe from God's wrath. When the walls of Megiddo were rebuilt in Byzantine times the builders included several small silver statues of men within the masonry, a distant echo of the original practice. Nor was this limited to people who built in stone; Northwest Coast Indians were said to have buried a slave beneath the center post of every great house, and the Maori of New Zealand had a saying that every building of importance stands on a sacrifice. In both Europe and Japan (at least) many buildings are said to be haunted by the ghosts of these victims. The brothers Grimm collected such a story about the castle of Höxter. Maruoka Castle in Japan is haunted by the ghost of the one-eyed woman who was sacrificed to made the castle endure. Why? The most common explanation given by old-school anthropologists was that every place belongs to some spirit that dwells there, and which must be appeased by a gift to allow any building to take place. Thus traditional Bedouin used to pour a little sheep's blood on the ground before erecting a tent, saying, "Permission, O possessor of this place." I wonder if it might have something to do with the ancient habit of building temples or sanctuaries around the graves of leaders, which might have made foundation on a grave seem natural. At any rate these stories are amazingly widespread and common, and archaeology provides evidence that they rest on a real and grim history. Building around existing graves sounds pretty convincing to me. That said, there's also the notion that construction of large structures has often been a pretty dangerous activity, and workers died in accidents with some degree of regularity. It seems plausible that those who died accidentally in the course of working on important projects would be said to have had their lives sacrificed for the sake of the work and the community/leadership. After all, people from most every culture seem hugely averse to the notion of random, accidental misfortune and death, and humanity seems to take far greater comfort in the thought that such tragedies had some greater meaning and served some greater purpose. It seems nicer to think that your loved one who fell off a scaffold died as a sort of sacred sacrifice, rather than as a victim of blind and meaningless chance. And once that comparison is made for the accidental deaths, and the concept becomes culturally important in helping people cope with accidental deaths, that paves the way for purposefully conducting actual sacrifices, to further reinforce and normalize the notion. I absolutely believe many societies would have prefered to kill extra people needlessly in order to make accidental deaths seem more meaningful, than to have fewer total people die and it seem to just be the whim of blind chance.